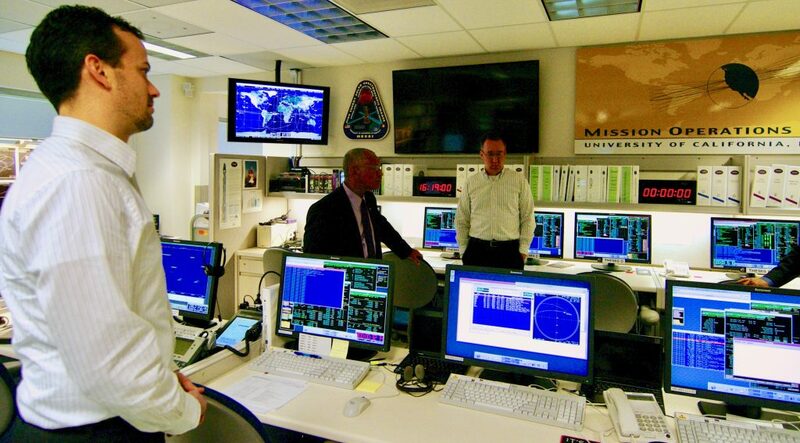 We are one of the very few higher education institutions with our own Multi-mission Operations Center (MOC), where our operators are currently managing telemetry and flight for several NASA satellites at once. SSL has implemented a fully integrated and highly automated ground data system supporting mission and science operations, mission design, navigation, and ground station operations. Our mission controllers are experts in the spacecraft and instruments they operate, working closely with principal investigators and science teams to configure and maintain the orbiting spacecraft and deliver science data to the ground. When scientists want to collect a certain kind of measurement, the controllers figure out how to build the command sequences to make the spacecraft achieve their goals. The controllers test the command sequences out on our simulator, and then upload them to the spacecraft from our MOC. To communicate with the spacecraft, we can use our own dedicated ground station in addition to ground stations worldwide that are part of the Near Earth Network (NEN), Deep Space Network (DSN), and NASA Space Network (SN).